The Re-Farmer | Sometimes, you need to go back, to go forward. 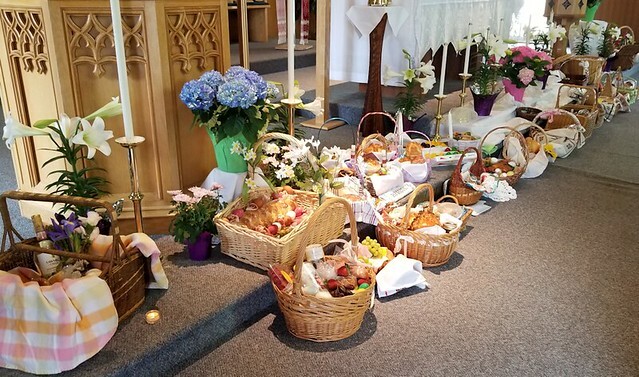 Today, we took our basket in for the traditional Easter blessing of the baskets, or Święconka, in Polish. This was taken during the snow storm we had on April 15. 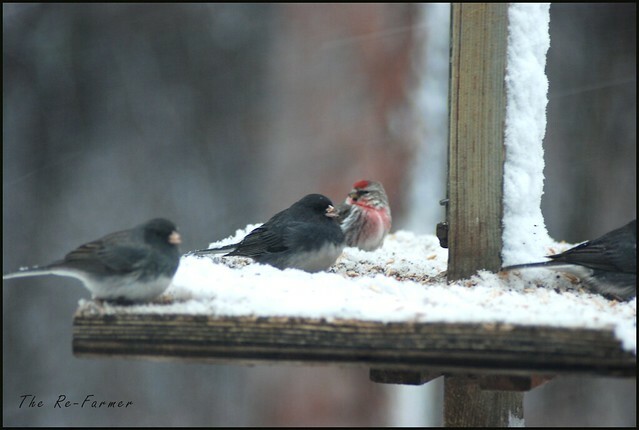 The juncos weren’t even feeding, really. Mostly, they just sat there, all puffed up, making the odd, desultory peck at some seeds. It must have been quite a shock for the juncos to be back for the summer, only to have winter hit them, instead! 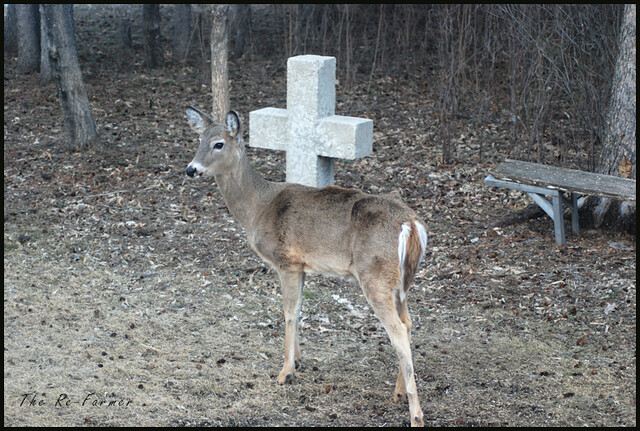 This lone deer that sometimes visits looks terribly hungry. … and count her ribs. 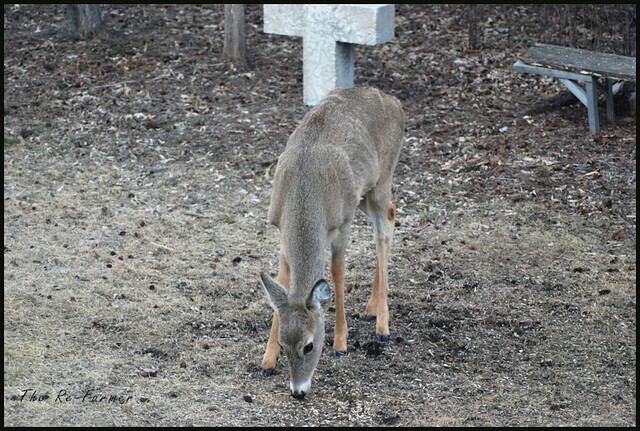 Despite the severe cold this past winder, due to the unstable polar vortex, none of the deer we have had visit our feeding station looked to be going hungry, except this one. It may be due to illness or parasites, too. My husband is home from the hospital today! It is so good to have him back! Even the cats missed him. They have been super cuddly. 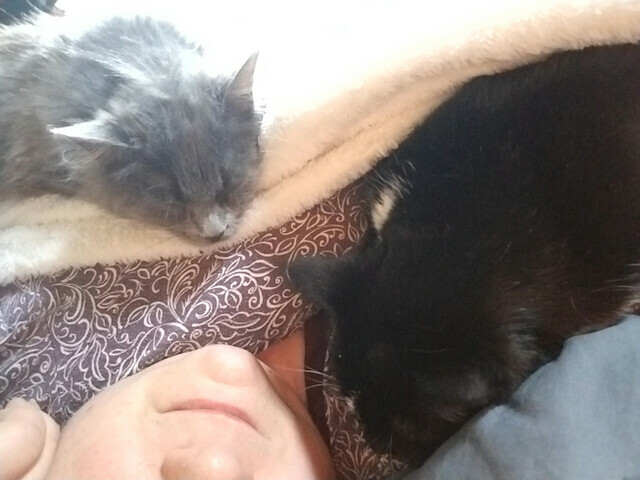 I’ve been waking up with these two, fighting to get under the covers with me. 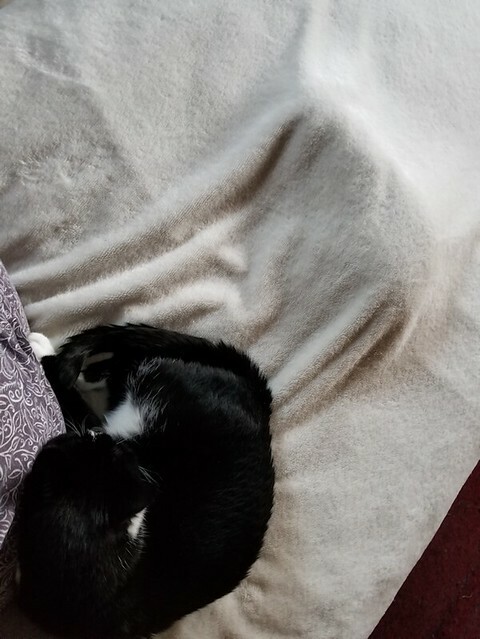 Mama cat won; she’s still under the covers in this picture, and Fenrir settled for sprawling on top of them. Which left me with one arm stuck out, and unable to put my phone away. This was handy when I started getting messages from my husband, telling me he would be able to come home by 10 or 10:30. This photo was taken the day after the storm blew in, at the beginning of April. As you can see, the snow was already melting away! 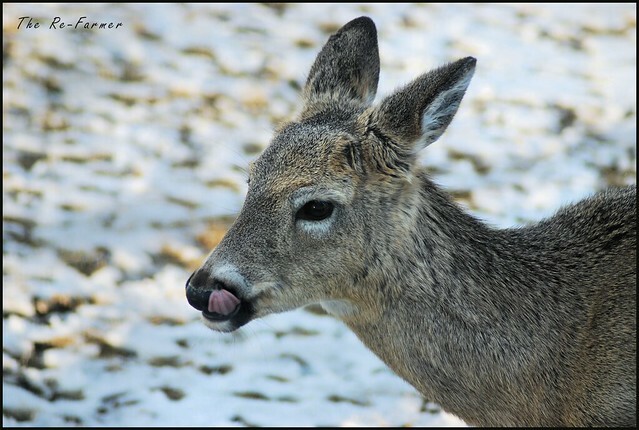 Which meant it was easier for our little buck here to find some tasty feed! While we are ready and waiting for my husband to come home from the hospital, we are also getting ready for Easter. This evening, I went hunting for horseradish. 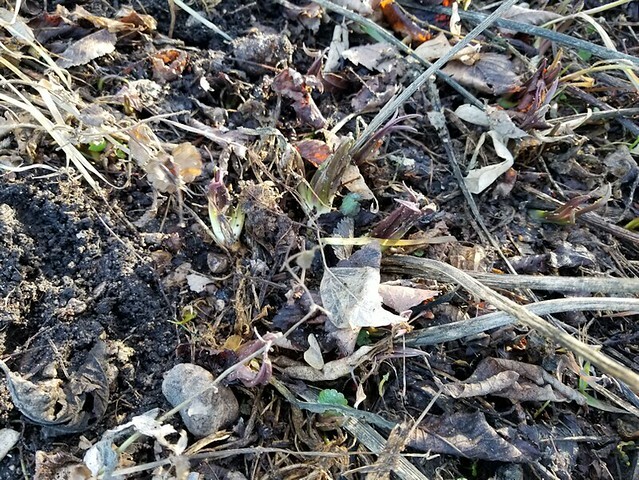 After scraping away some fallen leaves, I found some new grow peaking through the ground. I used a potato fork (the only fork that didn’t grow legs and walk away over the years) to dig up a few pieces. This bunch is growing under the power pole in the garden. I knew the area was very rocky, but wow. I had a really hard time getting that fork deep enough to get some roots out. No matter where I moved it, I was hitting rocks, just a couple of inches below the surface. I didn’t take out much. A larger piece for our own basket, and a couple of small pieces for my mother. If she wants, she can use one and plant the other, since she has garden space where she lives. For now, I’ve scrubbed the dirt off, and they are wrapped in damp paper towels. For our basket, I will peel some of the outer skin off the lower part, and save the top. The tradition is to use horseradish paste, mixed with beetroot, in the basket; the bitter taste of the horseradish symbolizes the pain of crucifixion Christ endured for us, while the sweetness of the beetroot symbolizes the joy of the resurrection. 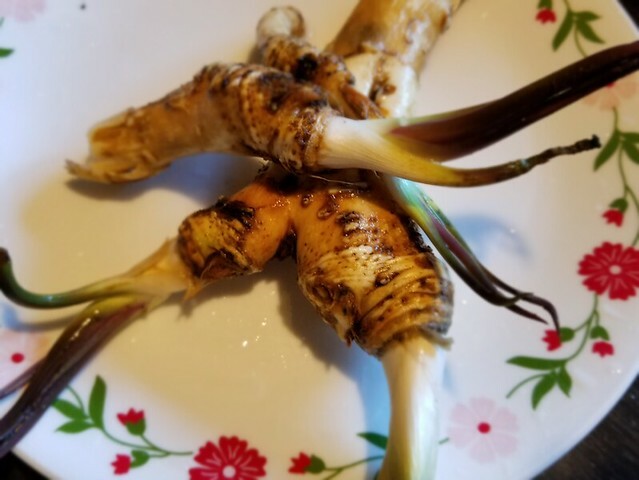 Growing up, though, we always used fresh horseradish root. My mother would sometimes give away pieces with sprouting tops, after the baskets were blessed, to friends to plant if they wanted. My mother planted the horseradish in strange places. One batch is under a spruce tree, which would be just as difficult to harvest as the ones growing among rocks. 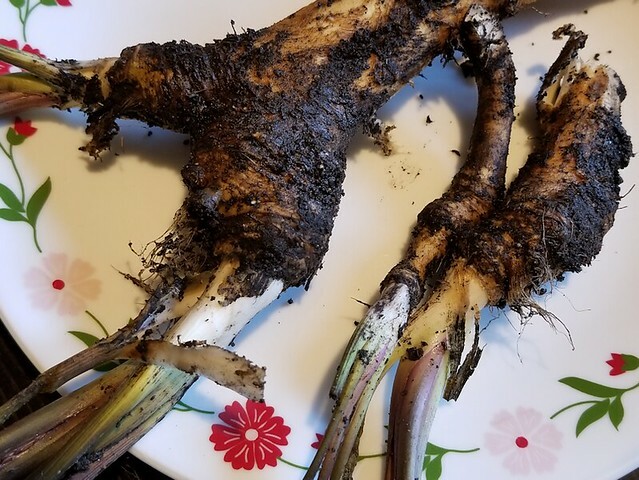 I found more growing among some of her flowers outside the living room window, which has better soil conditions, but harvesting it would mean damaging the bulbs of the flowers it’s growing with. I’m thinking of maybe using some of the raised planters that are still in decent shape, so the horseradish itself will also be contained better, and not spread too much. Something to figure out over the next few days! Well, my husband’s replacement hospital bed arrived this morning! I thought he was approved for a heavier weight bearing bed. Instead, he got the exact same bed as before. Which is rated to above what my husband is, but that didn’t stop the other one from starting to break. 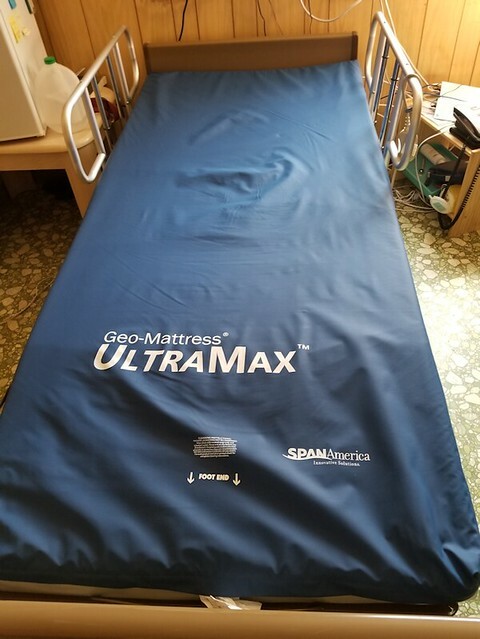 The mattress, however, is an “ultra” version that has a higher weight rating. It’s also thinner at the foot end, which I found interesting. 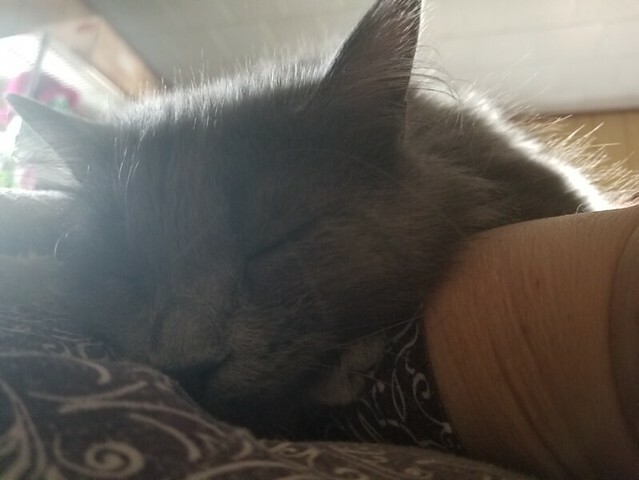 This is what I’ve been waking up to, lately. Critter of the Day: let me have some! This photo was taken on April 4, after the storm had passed. The feed left for the deer was covered, but they could still find it! With these two, the young male comes right in, while his mother hangs back, watchfully, before joining him. 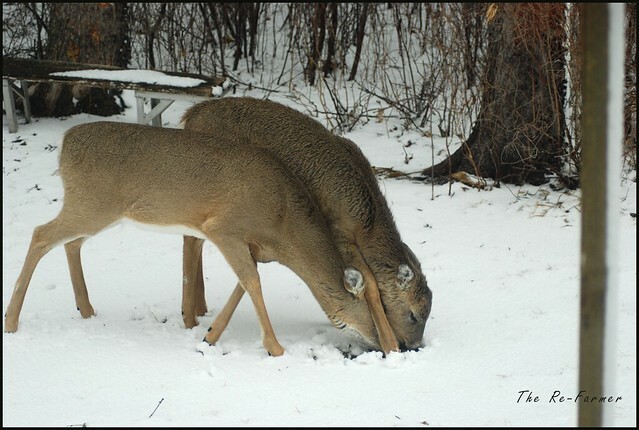 This day, it meant he had time to find one of the piles of deer feed already, and she just pushed her way right in there! What a lovely evening it was today! Though it was quite windy earlier, by evening it was calm and warm. The outside cats were in their glory!